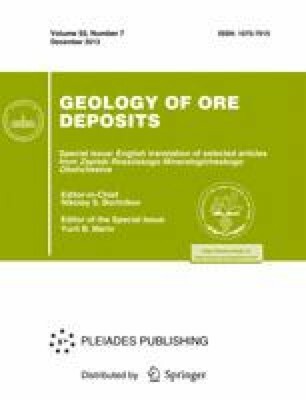 An assemblage of chernovite-(Y), As-bearing thorite, rooseveltite, and Cu and Fe arsenates has been revealed in Li-F granites, ongonites, and greisens of the Far East. The formation sequence of the above minerals is described in this paper. Chernovite-(Y) is a product of autometasomatic alteration of Li-F granite and ongonite, whereas other arsenates and As-thorite are products of greisenization. Original Russian Text © V.I. Alekseev, Yu.B. Marin, 2012, published in Zapiski Rossiiskogo Mineralogicheskogo Obshchestva, 2012, No. 6, pp. 118–125.